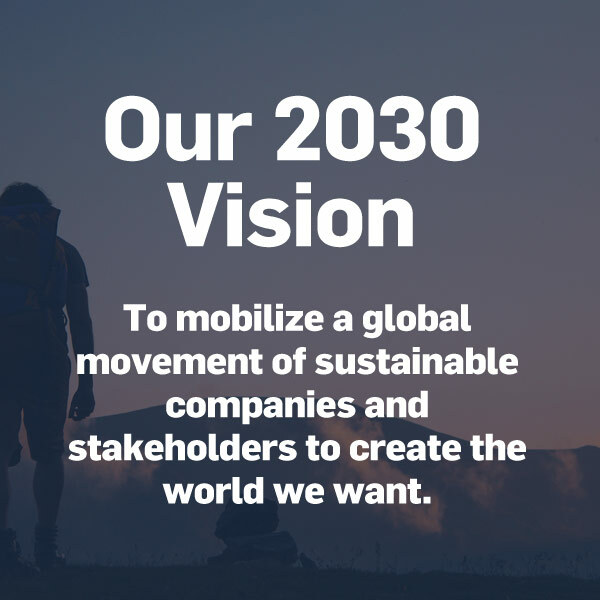 We are mobilizing a global movement of sustainable companies and stakeholders to create the world we want. The United Nations Sustainable Development Goals (SDGs) and the Paris Climate Agreement provide the most powerful common agenda the world has ever seen for achieving peace and prosperity on a healthy planet – with an essential role spelled out for business. As the world’s largest corporate sustainability initiative, it is our priority – and indeed our responsibility – to be a leading catalyst of the transformations ahead. We are devoting our capacities and global network to make it happen – based on the Ten Principles that the UN Global Compact is built upon. We must bring the full weight of the private sector to the SDGs to meet the 2030 deadline. To do so, we have shaped a new global strategy for engaging business to deliver on UN goals at unprecedented scale and impact. In preparing our global strategy we posed the question far and wide: How can the UN Global Compact deliver responsible business action at unprecedented scale and impact? We met with and heard from over 1,500 stakeholders – across business, civil society, Local Networks, UN partners and governments – on our unique role. It was a truly global consultation. What emerged is a resounding desire for the UN Global Compact to build on our core strengths – as a normative, principle-based and inclusive UN entity – to become the “translator” of the SDGs for business everywhere. In other words: to create a global movement of sustainable companies and stakeholders to create the world we want. What does this mean for our work? Our new global strategy includes amplifying existing work around the Ten Principles as well embracing new directions including driving business action in support of the SDGs – particularly through business innovation and partnerships with the UN. Responsible Business & Leadership Practices: Based on our UN General Assembly mandate, we will strengthen our work to promote UN principles and values to the global business community. 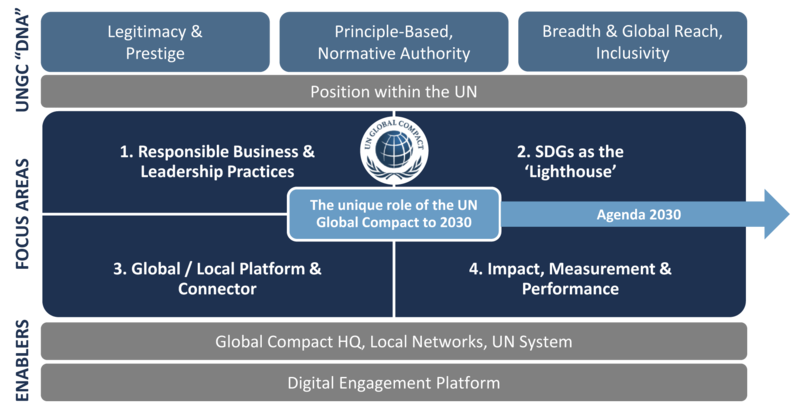 SDGs as the “Lighthouse”: Keeping the Ten Principles as our foundation, we will pivot towards the SDGs to enable a truly global business contribution to the 2030 Agenda. Global-Local Platform & Connector: As a neutral convener and consensus builder, we will develop the “Platform of Platforms” – curating the best practices, tools and initiatives of like-minded organizations to reduce duplication and increase impact. Impact, Measurement & Performance: We will focus on communicating impact and progress by business on the Ten Principles and the SDGs, to better understand the impact of corporate sustainability on both society and the bottom-line. Underpinning all of our work will be our Local Networks. The UN Global Compact’s wide geographic base is a core part of our identity, and we will strengthen our local presence in the years to come so that we can better reach all signatories and have valuable impact on the ground. Local Networks around the world are gearing up to fully support business and stakeholders on their sustainability journey. To meet the SDGs by 2030, the time to act is now. We invite you to join us on this journey, and become a pioneer in the new SDG era. We invite you to explore our extensive Toolbox – including best practice resources, executive briefings, new action platforms and events – for companies at all stages of sustainability, from beginners to leaders. Together, we can Make Global Goals Local Business.